"Brexit: The Uncivil War" follows the story of Dominic Cummings, the campaign director of Vote Leave, played by Benedict Cumberbatch. The U.K. is set to leave the EU in March of this year, and the country, including those in charge, don't seem quite sure about how it's going to play out on the ground. The nation is divided more than ever as how to proceed and so it's natural that there will be some soul-searching. 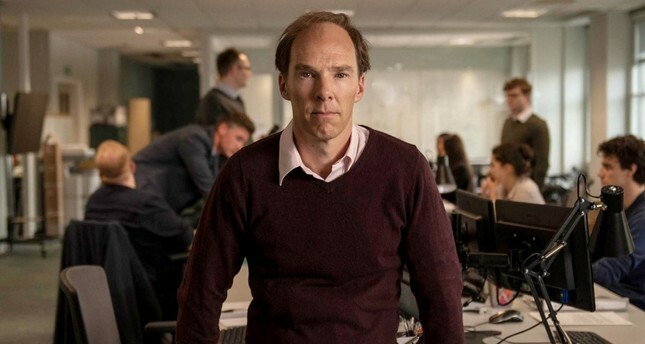 To that end Channel 4 has recruited one of the nation's best-loved actors, Benedict Cumberbatch, to tell the story of how Brexit was won in the first place. Playwright James Graham is no stranger to political drama. "Brexit: The Uncivil War" is his second political TV script, after "Coalition" in 2015. His theater credits include "This House" (which I was lucky enough to see), and "The Vote," set in a polling station and performed during the last 90 minutes of the 2015 General Election. Yes, he likes writing drama that is very much "of the moment." What seems to intrigue Graham in politics is how despite the political personalities, the voters and burning issues; politics and democracy with it seem always to be superseded by number crunching. And that provides the pathos for his latest offering as well. British film and theater stars can't run fast enough to be in his productions, it seems. Just like his other stories, "Brexit: The Uncivil War" has attracted the best actors that the small island has to offer. Well, no need to mince my words, this time he has attracted the biggest British actor of our times, Benedict Cumberbatch, whose name will ensure that any film will be spoken and tweeted about well beyond the English speaking world. So in that sense the film is doing a crucial service for the nation, explaining to millions out there how the UK got to be in the state that it is in now. "Brexit: The Uncivil War" follows the story of Dominic Cummings, the campaign director of Vote Leave. I must say I chuckled when I heard that a Benedict was playing a Dominic. I mean the religious implications are above my head, but the names involved already seemed like a parody of the British establishment. Must one name their child a three-syllabic old-fashioned name for them to get ahead in life? Okay, I'll let that pass and move on to my unpopular opinion. I did not care too much for Benedict's performance. He was, yet again, playing the misunderstood genius (see "Sherlock," "The Imitation Game," and "Parade's End") so Benedict was playing Dominic as Sherlock (clearly, no, I can't let the names pass). It wasn't that it was a bad performance, but it was a performance that we had seen before. Which, one could argue, gave space for us to see the other rather brilliant performances. Rory Kinnear's Craig Oliver, the main political strategist for Remain, acts, in a way, as Dr. Watson to Cumberbatch's Cummings/Sherlock, and explains to us why his side has lost. But if there is one face I would have to choose as the face of British politics in the film, it would have to be John Heffernan's Matthew Elliot, the political strategist for Vote Leave. That slightly harrowed look and nervous smile; the sense that next minute you might either be in the sticks or be applauded by the whole establishment. Graham's script shows that his default habitat is the stage. When one actor is delivering his lines (yes, the cast is male-heavy, just like politics itself), all the attention is on him and this can at times mean that background is a little neglected. There are no "incidental" characters. All parts are there to deliver a line, to prove a point. The film is about what happened "at the top" and the people of Britain' don't get represented much, except for a visit to a constituent's home, and one focus group scene which ends badly. Well, if this experience has taught the British political elite that focus groups are a bore, all the better. The background may feel slightly sketched, but then those of us who follow UK news are already familiar with the background. Graham represents British politics as a glorified debating society: we hear the pros, we hear the cons. In that great "fairness" tradition, we actually often get the "remainers" say they understand the "leavers." The film actually opens with Cummings saying that he believes that referendums are a very bad idea. It's all too damn civilized. This is the feeling I get too when I read a Spectator article by Cummings's wife as to how Cumberbatch came to their home and prepared to play her husband. Cumberbatch, a "remainer," is full of understanding for Cummings. They speak the same language. Of course they do. One of them is called Benedict and the other... okay, enough of that. Now while I try to figure out which of these characters and actors have been to which public school, the narrative moves on, and we see Cummings in pubs asking people what it is they don't like about Britain today. He pushes the idea of immigration, and people nod and say yes, too many foreigners come into the country. But his greatest hit is Turkey. Is it Turkey you're afraid of? Is it Turkey? Is it Turkey? He goes to his tiny manhole, the utilities cupboard in the propaganda headquarters, and covers the little door with ideas. Right across the two metal hangers he writes Turkey. It's Turkey! And when the race reaches its peak he jumps on a table in the office and makes everyone shout the mantra "350 Million Pounds and Turkey." One can't help but be flattered about one's country being so central in the downfall of another but let that pass as well. The 350 million pounds is of course, the 350 million pounds that Boris Johnson claimed EU was taking out of British coffers every week, 350 million pounds that ought to be spent on the NHS. We see Cummings reveal the bus to a baffled Boris Johnson- even he is a bit skeptical about the numbers, and looks concerned when he realizes they may actually win the election. But you know how Johnson is once he has adopted a stance. He goes for it full tilt. If anything, Johnson and Michael Gove are under-scripted and under-played in the film, which helps the story focus on the strategists rather than the politicians. The politicians are seen to be having a bad time of it indeed. Cummings doesn't even want them on his propaganda board. He has moved beyond politics into the realm of social media, where you can reach the voters without the need for politicians. Through the dodgy "analytica" people the film explains to us how social media is the perfect place to target unregistered and uninterested voters. Yes, this is Graham territory. Cummings is delirious when he learns that there are three million untapped voters in the UK and goes about "convincing" them through targeted ads.Although explicatory, the script remains nimble as the characters fire off their wisecracks. There are several cultural references and quotes to entertain the literary-minded. There's Thucydides, gunpowder treason and plot and at one point an exasperated Craig Oliver says "He's not the messiah, he's a very naughty 'expletive' 'expletive'!" talking about Cummings. Yes, that's how we like our British politics, bad mouthed and culturally acute. At the very end of the film one of the strategists for Leave gets on the "350 Million Pounds and Turkey" table and delivers Henry V's Band of Brothers' speech, you know the speech the King of England delivers - well at least in Shakespeare - before he attacks France. In the end Cummings gets his victory; a victory that seems for victory's sake only. The film opens with Cummings saying that Britain makes a sound, and that his job was to somehow amplify it and make it heard. This is the defense he gives to Oliver at the end of the film. Throughout the film too, Cummings lets us know that he is aware that what he is aiming for is nothing sort of regime change. Cummings's generation, and their older brothers before them, have been unnaturally interested in coups in other countries. So this remains his one sympathetic impression on me - at least he's kept that Oxbridge bent for political upheaval within the bounds of the sceptered isle.